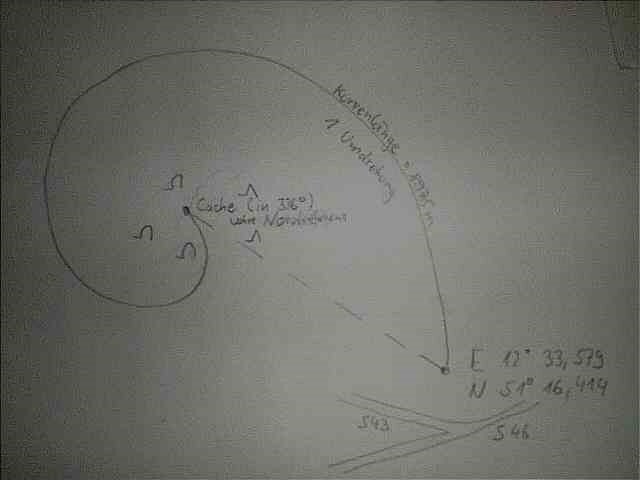 From the starting point the cache is in 336° (true northreference). Go to this point on an Archimedes spiral (exactly 1 rotation). The length of the way along the spiral is 8975 meters. Der Cache befindet sich von hier aus in 336° (wahre Nordreferenz). Gehe zu diesem Punkt entlang einer (Archimedischen) Spirale (genau eine Umdrehung). Die Weglänge beträgt hierbei 8975m. Qre Pnpur orsvaqrg fvpu hagre rvare xyrvara Ubymoeüpxr. Gur pnpur vfg haqre n fznyy jbbqra oevqtr.